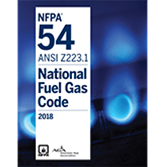 NFPA 54, National Fuel Gas Code provides industry-accepted guidance for the safe installation and operation of fuel gas piping systems, appliances, equipment, and accessories. The 2018 edition includes updates based on recognized risks, recent research, and the techniques, materials, developments, and construction practices in use today. From design to installation, maintenance, and inspection -- no matter what aspect of fuel gas safety your job involves, the latest edition of the National Fuel Gas Code is essential. Update to the 2018 edition of the NFPA 54 for greater confidence in CSST bonding. Be sure you're working with the most up-to-date information on the National Fuel Gas Code's bonding requirement for corrugated stainless steel tubing (CSST). All CSST used for fuel gas piping must be bonded to the building grounding system to prevent damage to the system due to nearby lightning strikes. In the 2018 edition, revisions to piping requirements include allowing listed arc-resistant jacket or coated CSST to use the appliance's electrical grounding connector as the bonding means and recognizing stainless steel smooth wall pipe and tubing products as acceptable piping materials. The minimum allowed wall thickness of carbon and stainless steel pipe is revised to Schedule 10, however joints on Schedule 10 pipe cannot be made with screwed fittings. Press-connect fittings are now an acceptable joining method for pipe. Revisions to the venting requirements include requiring listing to the appropriate UL standards for plastic venting materials, factory-built chimneys, Type B and BW vents, chimney lining systems, and special gas vents. Direct vent clearances to building openings for appliances with an input above 150,000 Btu (44 kW) are to be in accordance with the appliance manufacturer's installation instructions. An existing gas appliance installation is required to be inspected for combustion air and venting code compliance when the building structure that it is installed in is modified with specific air infiltration-reducing changes. 4.3 Prevention of Accidental Ignition. 5.2 Provision for Location of Point of Delivery. 5.3 Interconnections Between Gas Piping Systems. 5.4 Sizing of Gas Piping Systems. 5.6 Acceptable Piping Materials and Joining Methods. 6.2 Sizing Natural Gas Piping Systems. 6.3 Sizing Propane Piping Systems. 7.1 Installation of Underground Piping. 7.2 Installation of Aboveground Piping. 7.3 Concealed Piping in Buildings. 7.4 Piping in Vertical Chases. 7.6 Drips and Sediment Traps. 7.8 Manual Gas Shutoff Valves. 7.10 Systems Containing Gas–Air Mixtures Outside the Flammable Range. 7.11 Systems Containing Flammable Gas-Air Mixtures. 7.12 Electrical Bonding and Grounding. 8.1 Pressure Testing and Inspection. 8.2 Piping System Leak Check. 9.3 Air for Combustion and Ventilation. 9.6 Appliance and Equipment Connections to Building Piping. 10.2 Air-Conditioning Appliances (Gas-Fired Air Conditioners and Heat Pumps). 10.3 Central Heating Boilers and Furnaces. 10.6 Decorative Appliances for Installation in Vented Fireplaces. 10.8 Non-Recirculating Direct Gas-Fired Industrial Air Heaters. 10.9 Recirculating Direct Gas-Fired Industrial Air Heaters. 10.12 Food Service Appliance, Floor-Mounted. 10.13 Food Service Appliances, Counter Appliances. 10.28 Compressed Natural Gas (CNG) Vehicular Fuel Systems. 10.29 Appliances for Installation in Manufactured Housing. 10.30 Fuel Cell Power Plants. 10.31 Outdoor Open Flame Decorative Appliances. 11.1 Adjusting the Burner Input. 12.5 Type of Venting System to Be Used. 12.6 Masonry, Metal, and Factory-Built Chimneys. 12.11 Vent Connectors for Category I Appliances. 12.12 Vent Connectors for Category II, Category III, and Category IV Appliances. 12.13 Draft Hoods and Draft Controls. 12.15 Automatically Operated Vent Dampers. 13.1 Additional Requirements to Single Appliance Vent. 13.2 Additional Requirements to Multiple-Appliance Vent. NFPA 54: National Fuel Gas Code provides the most effective means of ensuring fuel gas safety on consumers' premises. NFPA 54: National Fuel Gas Code provides critical guidance for the safe installation and operation of fuel gas piping systems, appliances, equipment, and accessories. Installers, designers, AHJs, maintainers, inspectors, and facility managers look to the Code for design requirements; inspection, testing, and purging requirements; pipe sizing tables; and venting system rules that address fuel gas risks. Each edition builds on the next, through consensus-based changes that reflect the evolving needs of the field and the latest information about fuel gas safety. The 2015 NFPA 54: National Fuel Gas Code includes updates based on recognized risks, recent research, and the techniques, materials, developments, and construction practices in use today. From design to installation, maintenance, and inspection. The 2012 NFPA 54 incorporates indoor gas piping purging rules that address recommendations by the U.S. Chemical Safety Board (CSB). In response to a devastating gas piping purging accident, NFPA 54 received an emergency Tentative Interim Amendment to the purging requirements in the 2009 Code. With minor editorial changes, the 2012 NFPA 54 presents these new rules specifying mandatory use of combustible gas indicators and detectors so employers can identify the presence of fuel gas. Other major changes improve safety and facilitate Code application; such as a new bonding clamp location for Corrugated Stainless Steel Tubing (CSST) gas piping that clarifies bonding requirements added in the 2009 edition. The 2009 NFPA 54: National Fuel Gas Code reflects scores of proposals from the field. A new bonding requirement for Corrugated Stainless Steel Tubing (CSST) gas piping installed inside buildings helps protect against threats likely to energize gas piping. This edition also addresses a new system of connecting copper tubing using a crimping tool for press-connect fittings, and includes a new rule for a dedicated master shutoff valve for laboratories. Revised requirements for connectors to radiant tube heaters help prevent cracks, leaks, or fractures. Additional requirements for commercial cooking appliance connectors reduce the risk of fugitive gas, potential fires, and subsequent losses. The 2006 NFPA 54: National Fuel Gas Code includes revised data that helps designers and engineers properly size longer installations; dozens of pipe sizing tables have been extended with information for all piping up to 2,000 feet. A first-time requirement addresses support of rooftop piping to protect against wind damage. Revised requirements for appliance shutoff valves allow manifold systems with all shutoff valves in one location up to 50 feet from the most remote appliance. Definitions are organized by categories, and chapters dealing with piping, installation, and venting are grouped together for ease of use. Interested in other editions of NFPA 54? Use the drop down menu above to select the edition year you need.